Dixie's Note: Through the magic of Facebook, I saw a picture of one of Allen Cunningham's creations. I was intrigued with the whimsical nature of his work, but I could also see the inspiration of antique dolls clearly in his work. So I asked him to share his journey here. 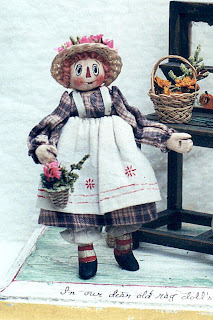 I have been experimenting/making dolls for just over 20 yrs (gosh! you'd think my work would be really good by now!) I was trained in teaching and fine arts (Bachelor of Science in education, Youngstown State University). I worked in the fine arts first, specializing in watercolor. My first efforts in doll selling were framed pen and ink illustrations and framed paper doll sheets. 3-d dolls followed closely....this was about 1997. I began selling at a store I frequented while I was living in Southern CA. This store was located in Orange, CA and it was called Uncle Tom's. I approached the owner with my work, she liked my things, and I would set up a display and sell at the open houses. 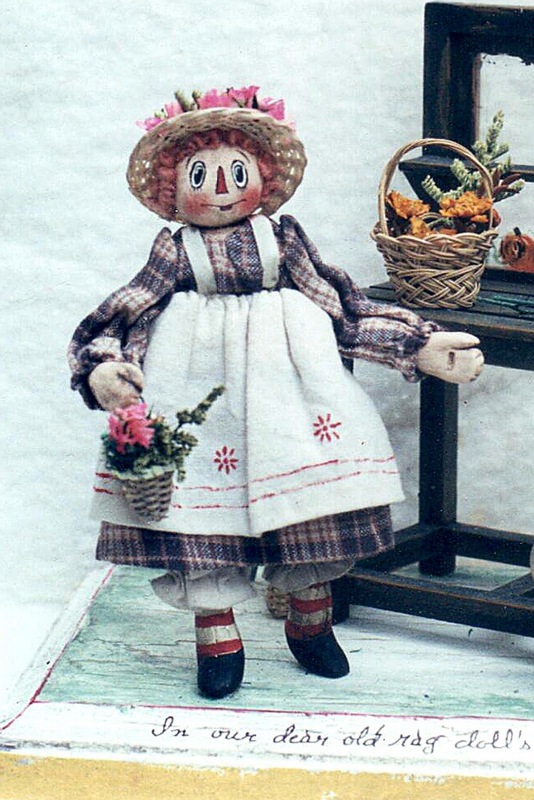 Some of these early attempts were inspired by all the primitive Raggedy Anne's that were in style at the time. I thought I could do "at least as well" as what I saw and that items in paperclay would be a little more unique. For the most part, I see a finished doll in my mind. Other than scale diagrams and clothing patterns, I seldom do detailed sketches. However, I will make notes, so I don't forget the ideas. Mostly, the end results will be as seen in my mind. If anything changes, it is the addition of more details...perhaps an added hair ornament, an extra trim on a skirt, or an added accessory in the hand. Inspiration- antique dolls and toys in my collection, books, magazine article, photos... antique illustrations form children's books. What is your favorite doll that you've made and why is it your favorite? A favorite creation was my recent work is a Hallowe'en Card Reader. She was quite large (for my work) at 12" tall and was inspired by the18th century Queen Anne-type dolls. This is a form/style that I have wanted to try for a long time and I finally made time to give it a try. My original attempts at doll making were definitely more primitive. I have worked to refine my sculpting, but still try to maintain a look that is antique doll-inspired. In the future, I hope to keep refining. I have an apartment built on to the back of my house. It is approx. 550 square feet. The kitchen is 200 square feet and this is my main work area. I have "stations" for sculpting/painting, sewing, and assembly.... and access to a sink, which is quite convienient. There is also plenty of storage for supplies, two bookcases and a cupboard for my "library" of reference books. With a bedroom, living room, and bathroom, it is also nice for my friend who visits from Oregon. As she is also an artist, we can shut out the world and work to our heart's content. It's very self-contained, my tiny kingdom...oh, and I don't keep a phone in the studio! 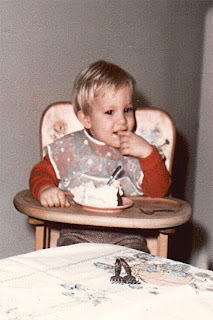 I loved dolls as a child...though, it's "action figures" for little boys, haha! I still have some of them. I must have "played nice" because they are in decent condition. I liked my Big Jim doll, er.... action figure... he had a great truck with a camper on back. We had many fantastic adventures together. 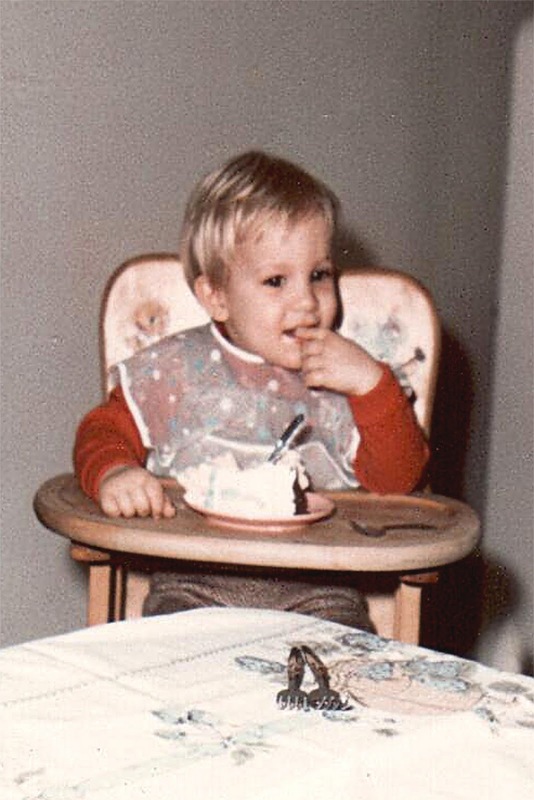 I have a doll that I made at age three or four. It was made with a glass 7-UP bottle, a sock head with inked features, and a corduroy tunic. As a child, Mom always said I had a wild imagination. I don't remember being consumed by tv.... there were only three channels then and I remember when the Watergate trials came on, that was my cue to go outside....boy, was that a boring show! I liked drawing, acting out plays based on storybooks (I played all the characters), wiffle ball and swing sets with neighborhood kids. I am definitely an antique doll enthusiast. They seem to call to me. They have some many secret stories and challenge me to discover what the stories may be. They are also such perfect little physical remnants of the past. 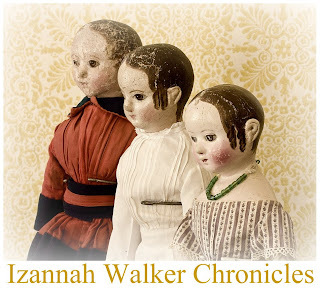 Call me crazy, but I can feel the "vibrations" of all the people that have come into contact with antique dolls. They definitely don't have to be pretty. I feel the humble dollies are often the most fascinating! At the moment, my favorite dolls are French fashion dolls, milliner-type dolls, and Grodner-Tal woodens. Hobbies.... doll and toy research, scoping out even the rattiest antique and junk shops, walking, reading, collecting Vaudeville/theatre memorabilia. Do you have a doll making technique tip you'd like to share? My doll making techniques are all a lot of voo-doo. I'm sure most people would think I'm crazy, if they saw me working! Regarding clothing patterns... paper towels work well for drafting a nicely fitted bodice... if careful, it can be sewn and it's a lot cheaper than muslin. 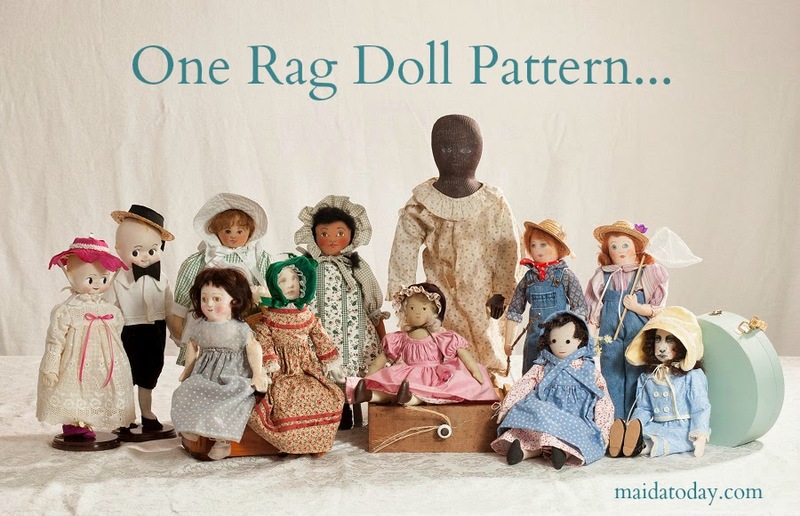 Is there anything you'd like to share about making antique inspired dolls that we haven't covered? Regarding overall look for antique-inspired dolls, keep the color pallet somewhat light and faded. I have seen some lovely attempts spoiled by harsh, saturated colors. Not a hard and fast rule, but just something I keep in mind and that works for me. There is always some new article written, a doll to see in a shop or show, or a fabulous antique prop... it's all out there waiting and that's what keeps me motivated and inspired. Who are your favorite doll makers (living or not)? Just off the top of my head... modern, R John Wright- brilliant and very nice. I got to spend time with him and his wife at the UFDC Convention in New Orleans.... old, Jumeau and Gaultier firms for their fashion dolls. What museum that you've visited has been most influential in your work? Influential museums.... one that really pops out is the Smithsonian National Portrait Gallery...OH! a wonderous place!!! "It's very difficult to keep the line between the past and the present. You know what I mean? It's awfully difficult." For me, it's not about financial gain or "fame." I hope that people get a warm feeling and from my work. Something very personal between them and me. I would also be honored if my work was cherished for a lifetime and passed on to generations in the future. Click here to visit Allen's blog! I very much enjoyed reading about Allen's work and creative process! I have been a fan for many years, and it was nice to get to know a little more about him and his work. His dolls are even lovelier in person! Wonderful story, thank you for sharing more of Allen with us all! Oh how interesting meeting such a talented artist. What beautiful dolls and my what a collection of antique dolls, I'm drooling. Thanks for sharing. I think my heart skipped a beat when I saw this latest interview! What a wonderful peak into the mind and studio of a great artist! I enjoy these artist features so much. :-) Allen, it's been fun reading your story and seeing the progression of your work. Thank you!